When Eanes ISD began this quest into 1:1 four years ago, there was some early research that showed the advantages to running such a program in K-12 schools. In this white paper, we’ll review our initiative, highlight national and global findings around 1:1 initiatives, compare/contrast a Bring Your Own Device (BYOD) environment vs. a School Provided 1:1 environment, and finally outline some thoughts on the future of K-12 education and technology. The Eanes ISD LEAP Initiative (Learning and Engaging through Access and Personalization) aims specifically at increasing student engagement and shifting towards a personalized learning model that is student-centered and authentic. This aligns with our district-wide goal of creating student-centered authentic learning experiences that educate the whole child. We want students to go beyond being content consumers to constructing their own understanding and moving to a level of content creation to show evidence of learning. In reviewing student and teacher survey data as well as anecdotal evidence, we are well on our way to achieving these goals. The effects of the LEAP initiative have impacted three major “user” groups in our schools: students, teachers, and parents. A review of survey data from 2011-2014 shows that students consistently reported feeling more engaged in class when iPads were used at Westlake High School. Those students indicated mild to significant increases in engagement ranged from 80.9% to 87.2% over the three years of the study. A full 100% of students reported that they noticed an increase of communication between teacher and student since the introduction of iPads. Distraction was a major concern at the outset of the program as data from the spring 2012 survey showed that 54% of students felt like the device was a source of distraction. Survey data from the spring of 2014 showed that number decreased by almost 20%. In the area of creativity (creating movies, art, presentations, animations or other unique content), the data showed an overall increase of 11.8% from the 2011 data to the 2014 data. When asked, “Overall, having the iPad has enhanced my learning experience.” The three-year range showed that 83.5% to 87.9% of students responded with 3 (moderate) to 5 (extreme). Our students are creating more digital artifacts than ever before. Students are writing blogs, publishing online portfolios, creating award winning videos and even coding in Kindergarten. All of this content has allowed students to create their own positive “digital footprint” which will help them procure enrollment or employment in their future post-graduation. Application processes for career and college now reach far beyond the transcript and extracurricular interests.The degree to which both businesses and universities investigate a prospective student/employee’s “digital footprint” has increased exponentially the past 5 years. According to a Kaplan of 2014 study, 35% of college admissions officers say they look at applicants’ social media profiles, an increase of 5% from the previous year. A 2014 Career Builder survey showed that 45% of employers use search engines like Google to research job candidates, continuing an upward trend amongst businesses. In the area of teacher to student communication, 96.8% of teachers reported “moderate” to “greatly improved” communication with students because of the iPad. A large majority (90.3%) also reported the iPad made student assessment “easier” and were able to get real-time feedback to gauge students’ learning. Teachers that utilize the iPads regularly spend less time grading paper quizzes (which means less time at the copy machine) and are able to get and give instant feedback on how students are meeting learning objectives. While distraction was an initial concern, classrooms that have shifted to a more personalized, student-centered approach generally report less distraction and behavior issues than in a traditional, stand-and-deliver instructional model. While not an intentional outcome of the LEAP Initiative, having mobile devices in the hands of students has increased parental awareness around their children’s digital lives. Eanes ISD has extended the learning beyond the school walls into the homes, and with that comes a learning curve for parents too. What initially started as “Digital Safety Night” has grown into full-fledged semester-long online courses where hundreds of district parents keep up to date with the latest trends in social media, screen time, and the phenomenon of digital footprints. Eanes ISD now provides regular parent workshops and resources throughout the school year for parents at every level. Prior to 1:1 iPads, Eanes ISD purchased many technology items which performed different functions to facilitate learning in the classroom. Whether it be a Smart Airliner to control the classroom computer or a cassette recorder to record students’ reading, the following items represent a list of technology purchased by the district prior to the LEAP Initiative. Most of the items, unless otherwise noted, were purchased for each classroom. One major advantage of an iPad 1:1, is that now all of these items are replaced with free or inexpensive apps with access for every student. Dictionaries (still required by state to purchase), TI-84 calculator (piloting replacement with free Desmos app), Textbooks (see note in closing section), and paper costs (continuing to decrease with integration of iPads, Google and Learning Management Systems). This means that using technology by effectively integrating into a lesson (“supporting instruction”) versus just allowing students to play a learning game (“providing direct instruction”) is more meaningful and impactful for students. At Eanes ISD, the most effective 1:1 classrooms use the iPad in a manner that enhances and amplifies learning outcomes. iPad improves Kindergartners literacy scores – Students with iPads outscore those without on all literacy measures in a 9-week study of kindergarten students in Maine. Pearson Foundation Research: Survey on Students and Tablets 2012 – More than 6 out of 10 of college and high school students study more effectively and perform better in class with tablets. iPad a solid education tool, study reports – a Houghton Mifflin Harcourt study in California showed a 20% increase on math test scores in just one year. Oklahoma State University – More than 75% of students claimed the iPad “enhanced” their learning experience in college. 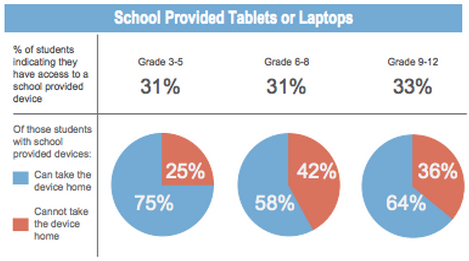 Survey: 9 in 10 Students Say Tablets Will Change How They Learn – A survey of 2,252 students in grades 4-12. 83% said tablets help them learn in a way that’s best for them. iPads in Medical School – Students with iPads scored 23% higher on exams in University of California Irvine’s iMedEd Program. 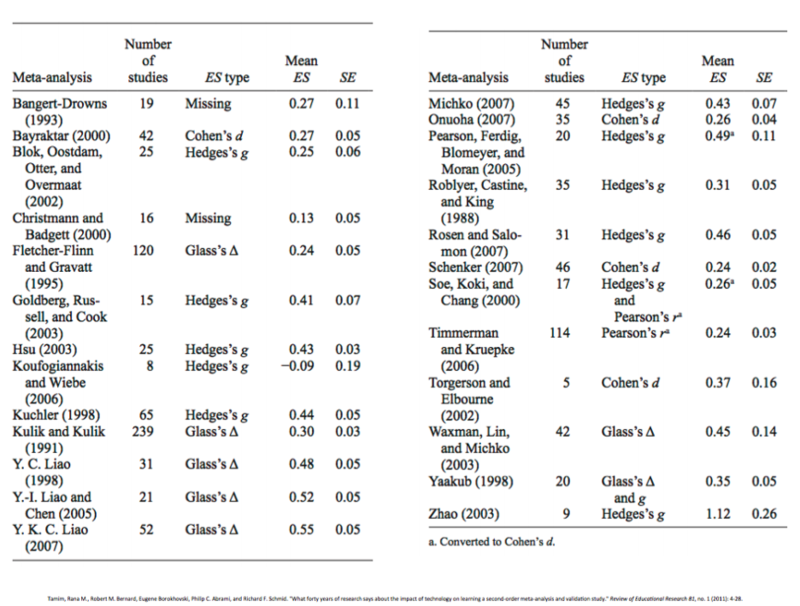 While this research may indicate that just handing students an iPad will help them learn better, looking deeper into the results and implications of three decades of research on technology integration shows that the pedagogy and application of learning technology and accompanying apps play a significant role in this success. – Reasonable consistency in how these tools operate. – Insure that all the devices could connect to our network. -Provide a subsidized device for those students that do not have a device. – Be knowledgeable in the multiple operating systems for troubleshooting. This all takes away valuable instructional time and ultimately means that a teacher is limited in teaching critical thinking and creativity. The challenge of getting devices with different operating systems to communicate with each other directly influences our emphasis on collaboration and communication. If every device is the same, then training can be standardized. When all students have the same devices, then the variability of learning on the devices falls into the hands of the teacher and students. Creating personalized learning paths for students means that our teachers need to have familiarity with the devices and the resources available to their students (as Dr. Puentedura states above) and strategies for higher-level integration of learning aligned to state standards. In a 1:1 environment, more time can be spent during professional development on the integration of pedagogy and technology to meet standards in the classroom rather than spending time on learning the multitude of operating systems in a BYOD environment. In a district-supported 1:1 environment, mechanisms can be put in place to manage all the devices. These Mobile Device Management (MDM) systems enable a district to restrict apps, filter the internet, and lock-down devices when necessary for student focus or testing. In a BYOD scenario, students can bypass our network and download inappropriate apps and possibly access inappropriate websites. The district has no authority or level of control over their devices. In addition to the lack of control for classroom management, the district would not be able to lock-down student-owned devices for online testing (a requirement from the state). Our increase in the use of online textbooks also requires certain types of devices (like iPads) in order to view the content. In a BYOD environment, some students would not be able to view their textbook if they do not own a device with the minimum requirements from the textbooks provider. According to Project Tomorrow’s 2014 report: The New Digital Learning Playbook, 33% of high school students have access to a school issued device. That number has grown significantly from the less than 10% who had access in 2011 when the LEAP initiative began. The research also points out the 41% of districts now allowed students to bring their own devices (an increase of 19% from three years prior). Both state and national data point to upward trends in both areas. The data also supports the assumptions that, like Eanes ISD, most districts start out with a Bring Your Own Device policy before implementing a school-provided device. There are very few national instances where a program with a 1:1 implementation went toward a BYOD approach. Eanes ISD supports a spectrum of school-issued 1:1 devices, a BYOD approach, and multiple computer labs or carts, because different tools may be needed based on the learning objective. It’s difficult to predict the future of anything, much less technology. Most predictions are based on data and long-term prognostications based on research. The New Media Consortium’s yearly K-12 Horizon Report is a robust report that has had a high level of accuracy over the years when it comes to predicting educational technology. This past year’s report makes predictions such as cloud computing being on the “One Year or Less” horizon and items like the Internet of Things and Wearable Technology entering schools in the next four to five years. Locally, we also look at national and state trends with legislative direction to guide our thinking. With the national and state demands to increase the use of assessments online, districts will need to supply devices during those testing windows since rotating through computer labs isn’t feasible. This year Eanes will be one of the first districts to pilot test the use of the iPad as a calculator (with our 8th Grade STAAR math exam). We have also started conversations around pilot testing the Pearson TestNav 8 app for ACT Aspire tests on the iPad. The textbook market is also at the tipping point transitioning into a period of more digital text vs. hard copy. The federal government and publishers see the shift to mobile devices and tablets and are planning accordingly. In 2-3 years, there will be limited options in the “non-digital” market meaning that our students will need some device to access content. The FCC estimates a $3 billion dollar savings in education once that shift happens completely (and the cost of tablets continues to drop). States like Florida have adopted legislation that requires all districts to spend at least half of their instructional materials budget on digital content by 2015-16. Eanes has started to realize a some of these savings, but textbook companies are still charging close to the same price for their e-versions. In terms of adoptions, the majority of our textbook adoptions have an online/digital version as an accompaniment. Some of our adoptions (e.g., like science) offer only a digital option, a growing trend among providers. We are piloting a project for our teachers to create their own textbooks, which will be owned by Eanes. This option will help us realize both more significant savings and more rigorous learning tasks for our students. The future world that our students walk into will be immersed in technology and heavily influenced by social media. Besides just creating those “digital footprints” mentioned earlier, it’s imperative that schools educate students in the area of digital responsibility and give them essential skills in order to be a good digital citizen. The future job market for our children is also expanding, especially in the realm of computer science. With the projected growth of jobs in Texas requiring some level of computer science education, it’s predicted that only 31% of jobs will be fillable with current educational models by the year 2018. In the fall of 2014, Pearson released a report titled “The Learning Curve”. It represented global data about test-taking and job skills that students are learning in various countries around the world. In one section they listed the above graphic called “Beyond the 3Rs”. It represents the new skills the world is looking for when it comes to the global economy and skills we need to prepare our students for in their future. Posted on May 14, 2015, in iPads, Leadership and tagged 1:1, benefits, byod, data, eanes, eanes isd, education, iPad, ipads, k-12, learning, research, study, technology, white paper. Bookmark the permalink. 6 Comments. Good read. Too many districts are firing from the hip with 1:1 programs and not thinking long term. It benefits education as a whole if we take the time to collect as much data as possible and share that data with others. Well done. Thanks Jeff. It’s easy to get people excited around 1:1 in the beginning, but maintaining that momentum for several years takes a lot time, energy and constant reflection. We’ve made a lot of adjustments over the years and are still trying to improve. There’s no ceiling on excellence.